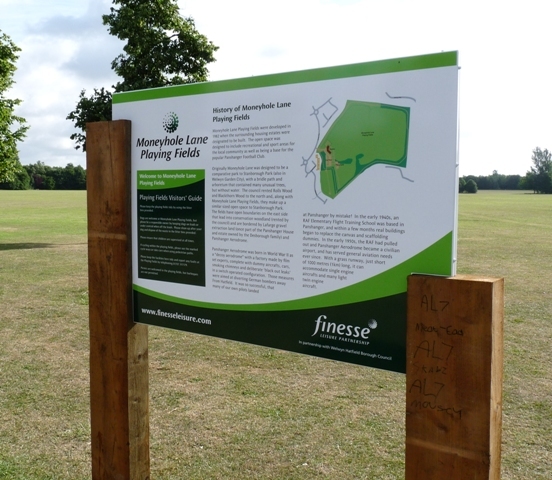 Moneyhole Lane Park is located in Panshanger, Welwyn Garden City. The Friends organisation for the park, are a small but growing group of people who want to see good things happen at the park. We are working hard to make the park a tidy, safe, and most of all a fun and relaxing place to be. This is a local community powered, volunteer driven initiative. This is the home on the web on the Friends of Moneyhole Lane Park in Panshanger, Welwyn Garden City. We are a small but growing group of people who want to see good things happen at the park. We are working hard to make the park a tidy, safe, and most of all a fun and relaxing place to be. This is a local community powered, volunteer driven initiative. This page was added on 21/05/2010. This WAS a nice area until it was overbuilt. It was much more fun as a kid in Pre-Moneyhole Park days and prior to the gross overbuilding of the entire area. A lot of people that moved in don’t even appreciate such features as the airfield. We used to play in the old gun turrets and air raid shelters and walk freely. It’s been ruined now.